A few days ago I was reading the Trinidad Guardian online, and noticed that, in response to the recent rise in murders in 2006 (+37%) someone had called for a day for everyone to protest by wearing black, and putting headlights on for the entire day. This follows a recent day of mourning where everyone wore white, and performed a symbolic act that involved lying in the streets of Port of Spain. And there have been countless calls for prayers, fasting, a greater role for church leaders, condemnation for criminals, protests, etc. I can tell the Trinis from experience: these things don’t work. We in Jamaica have an abundance of evidence that they make no measurable difference. Our murder rate almost tripled in the past few years, and we are doing as many of these kinds of things as we can think of, including mass rallies of all kinds. I happen to live beside a church that insists on sharing the Sunday services with the neighbourhood through its loudspeakers that face out from the church. Every week, (and on many weekdays) there are loud calls for God’s redemption from the crime that has turned us into the Murder Capital of the world. I cannot see that these tactics are working, and I doubt that they will work any differently in Trinidad. On the History channel this afternoon, I happened to see a programme on the Black or Bubonic Plague in Europe, that wiped out half the population of the continent. Like us, people in the 1300’s sought to find religious solutions to the horror of the illness, which killed people within days after causing high fevers, chills, vomited blood and black boils. They sought refuge in the Catholic Church, and from the Pope, who of course was powerless to stop the carnage. There was one very moving picture depicted of a statue of the Virgin Mother being taken miles from one place to the other to help ward off the evil — to no avail. 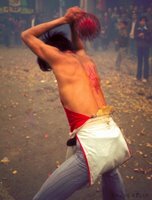 At some point, a few in Germany decided that the priests were not being godly enough, and started a group they called the Flagellants. Membership in this group was restricted to those who were willing to spend days marching through the streets beating themselves (and each other for good measure) until their backs were rendered a bloody mess. They eventually took to beating first Jews and then priests, at which point the Pope decided he’d had enough and brought out the troops to stop their fun. From our point of view it is a curious sight — men beating themselves on the back with whips in order to… stop the Bubonic Plague. Given that the Plague was spread by a bacterium from person to person through bodily contact, it must seem to us to be a pretty bad choice of cures. Which brings me to Trinidad. I think we Jamaicans can teach them a thing or two about some of the things that we have tried that just do not make any difference. In fact, it strikes me that reinforcing some religious beliefs can not only deepen crime and violence, but also further divide our societies. There are lots of Bible verses, for example, that people use to sanction violent acts like beating children, discriminating against gays and promoting the death penalty. Recently, a group of Christian lawyers in Jamaica appeared to be protesting against the new Charter of Rights because it did not discriminate against gays sufficiently. The book “The Sins of Scripture” by an Episcopalian bishop is a eye-opening excursion into church history that outlines many of these ways in which the claimed “inerrancy” of the Bible is used to justify all sorts of historical and present-day evil, in the name of God. Furthermore, using religion is the quickest way to divide our people within the countries that make up the region. For example, our new Prime Minister made a call yesterday at a Seventh Day Adventist church that pastors will be appointed to boards of government institutions across the country. In principle, having a spiritual viewpoint in positions of power is an excellent idea. However, the truth is that we all have our favourite religions, including our new Prime Minister, and we would want our favourite pastors to be appointed to the more important positions. Furthermore, we also have those religions that we either fear or despise. The great thing about the “Church of Satan” in the USA is that its very existence stops the government from going too far in the direction of mixing church and state. While I doubt that there is a chapter in Jamaica, there are enough denominations and religions that exist that most of us don’t want to place anywhere near the levers of power. These include the old chestnuts such as Jehovah’s Witnesses, the Mormons, Catholics, Rastafarians and the permanently crusading clap-hand tent church around the corner. To hear that the pastor who recently prophesied that Portia would win the race to become the next Prime Minister has been appointed to the board of the Electoral Office of Jamaica would probably worry everyone who does not belong to his church. Perhaps Portia will come up with a short list of approved churches and pastors, to prevent the boards from making errors. Then, we could all know which religious leaders have received the stamp of approval. But, that would probably put us all in even more trouble. I could imagine that fracas that would break out, as power is given to some and not others, and placed in the hands of some holy men and women, but not others. Having said that, I do have a few ideas to share with the readers of this website from a prior blog: “The Source of Crime in Jamaica“. More on this to come in future posts.